TABER, John, a Representative from New York; born in Auburn, Cayuga County, N.Y., May 5, 1880; attended the public schools; was graduated from Yale University in 1902 and from New York Law School in 1904; was admitted to the bar November 15, 1904, and commenced practice in Auburn, N.Y.; supervisor of Cayuga County in 1905 and 1906; special judge of the county court 1910-1918; delegate to the Republican National Conventions in 1920, 1924, and 1936; chairman of the Cayuga County Republican committee 1920-1925; president of the Auburn Chamber of Commerce in 1922; elected as a Republican to the Sixty-eighth and to the nineteen succeeding Congresses (March 4, 1923-January 3, 1963); chairman, Committee on Appropriations (Eightieth and Eighty-third Congresses); was not a candidate for renomination in 1962 to the Eighty-eighth Congress; practiced law in Auburn, N.Y., where he died November 22, 1965; interment in Fort Hill Cemetery. 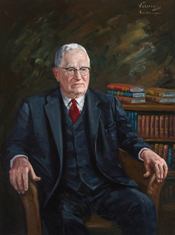 Henderson, Cary S. Congressman John Taber of Auburn: Politics and Federal Appropriations, 1923-1962. Ph.D. diss., Duke University, 1964.